McCormack informs Jules Rosenthal of a meeting he had with John Collier of A. Barker & Sons (South Africa) Ltd. while he was in Capetown. 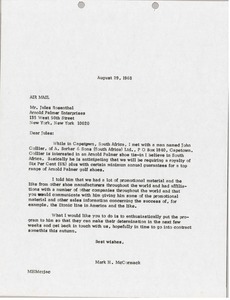 He explains that Collier is interested in an Arnold Palmer shoe tie-in in South Africa. 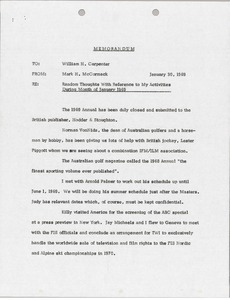 McCormack has informed Collier that Rosenthal would communicate with him on the matter and provide him with more information. 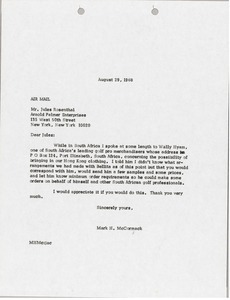 McCormack informs Jules Rosenthal that while he was in South Africa he spoke to Wally Hyam, a leading golf pro merchandiser in South Africa, about the possibility of bringing in their Hong Kong clothing. McCormack has told Rosenthal that he is unsure of the arrangements they had made with Bellita but that Rosenthal would communicate with him and provide him with more information. 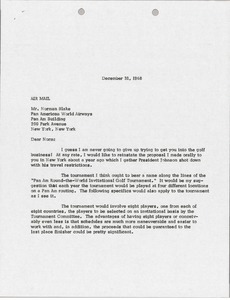 McCormack proposes a Pan America international golf tournament. A general format is described as well as, prize packages, promotional ideas and tour routes. 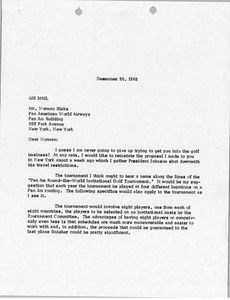 Additionally, McCoramck suggests filming the tournament. McCormack indicates that his company(likely Trans World Sports) would be able to produce the film. 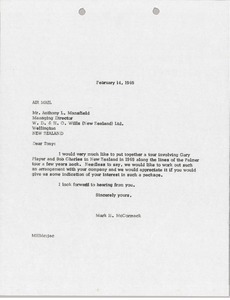 New Zealand - McCormack would like to get Gary Player into New Zealand to play a series of exhibition matches with Bob Charles. 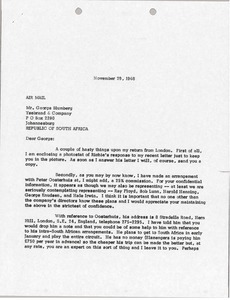 He would also like to work out an arrangement with Mansfield's company, and would like to know if he is interested. 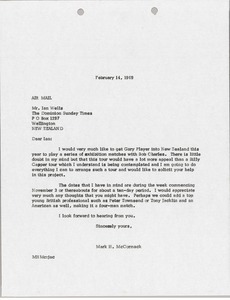 New Zealand - McCormack would like to get Gary Player into New Zealand to play a series of exhibition matches with Bob Charles. 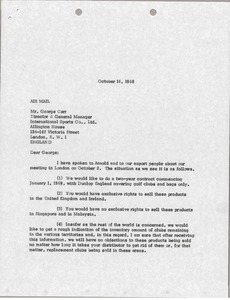 McCormack believes that the tour would have more appeal than a Billy Casper tour. 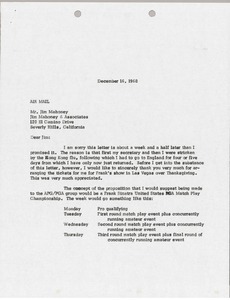 He recommends having a young British professional such as Peter Townsend or Tony Jacklin, and an American as well, to make the exhibition a four-man match.